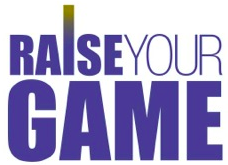 Raise Your Game’s unique workshops and classes combine proven sales strategies and improvisation techniques for a powerful combination. Experiential learning allows you to recreate real-life business situations in real time and gives you a chance to work on the challenges you face every day. We’ll guide you through a series of interactive exercises and strategies, followed by discussions, providing the perfect training ground for new ways of thinking and transformation. Participants will have the rare opportunity to practice skills and learn from each other in a safe, nonthreatening environment. You will walk away with a heightened awareness of yourself, renewed energy, and excitement to tackle the challenges of growing a business. Tap into your inner creativity. Let go of judgments that stifle new ideas and solutions. We will take you through a brainstorming process and watch the ideas flow. We will focus on how on you can make an impact on your audience and how to deal with the curveballs clients throw at you. We will work on being fearless and gaining the confidence needed to strike up a conversation anywhere, anytime, with anyone, and how to follow through to build your network. We will teach you key aspects of negotiating techniques, which include understanding the personalities of clients and who you are dealing with. Learn to stay in control of the conversation. Learn how to conduct these important interactions through active listening, collaboration, and overcoming the challenges that make these calls awkward. We will cover the strategies and skills that will enable you to bring in business, such as questioning strategies, active listening, building a rapport, and how to get to the next step to close the deal.